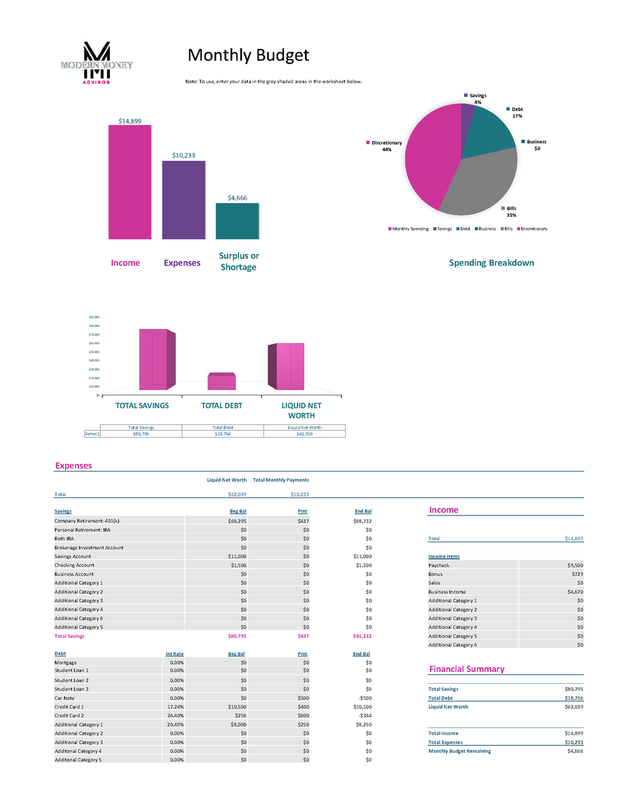 Get your finances organized with my easy to use budget template. Tired of winging it with your finances? Too busy and overwhelmed to deal with complicated formulas and apps that take forever and a day to get set up? Use this template to quickly organize all the information you need onto one simple worksheet. I've been using this since I was 18 years old and I've perfected it by keeping it SIMPLE and EASY!! Finish this in 15 minutes off the top of your head and then go back and fill in any details you don't know off hand. I've had so many people tell me they aren't sure how much savings they have, how much debt, what the interest rates are, etc. The first step to getting your finances in order is to take inventory of what you have and where you are financially. If you take this step, you're already taking action toward creating a better financial strategy for yourself. To download my budget template right now and get access to all the other tips and tools I send out periodically in my newsletter simply sign up and you'll immediately get a link to download the budget and get started. Sign me up and download free budget template!